The Eagle Reserve -- "One Weekend a Year for Scouting"
Join us as we build a corps of Eagle Scout alumni who volunteer one weekend a year to help take a local Scout troop camping. It's simple, it's a good time, and it's our duty to Scouting. How? Follow the steps below, dust off your boots, and go help the next generation of Scouts. 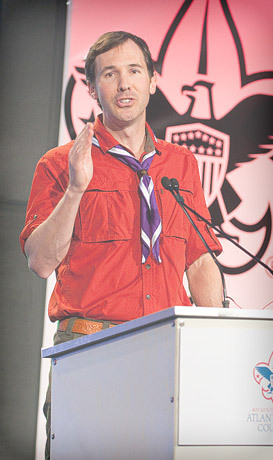 In my travels across the country, I've heard again and again that Eagle Scouts of my generation want to give back to Scouting, but serving as a traditional weekly leader often doesn't suit our situation in life. I've also seen that many troops lack the outdoor skill and leadership to provide their Scouts with the high adventure so crucial to a good experience. So, we attacked both problems and developed a program where a group of Eagle Scouts can help chaperon a local troop on a camping trip, once a year. The pilot took place outside <?xml:namespace prefix = st1 /> Atlanta in Fall 2008 and the Eagle Reserve program is being rolled out nationwide. We just need Eagles to volunteer to get back into their element and go camping with their friends...and take along a group of Scouts. This is our generation's chance to give back and create this Movement's future. 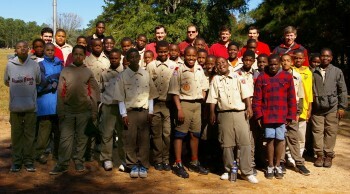 Scouts of Troop 100 camping with Atlanta Eagle Scout alumni at Bert Adams Scout Reservation. Eagle Reserves: Eagle Scout young alumni helped Troop 100. AT is back row, left.